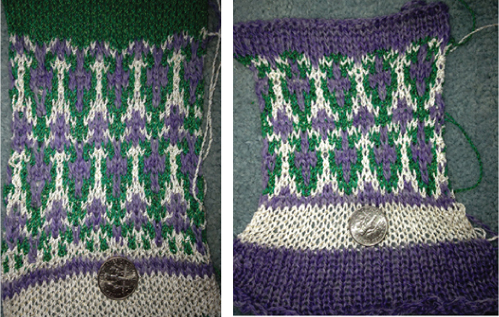 A redesign: one method to avoid pattern shift problems and insure success is to use units in the design that are 2 stitches high, as seen in the motif and its separation below. 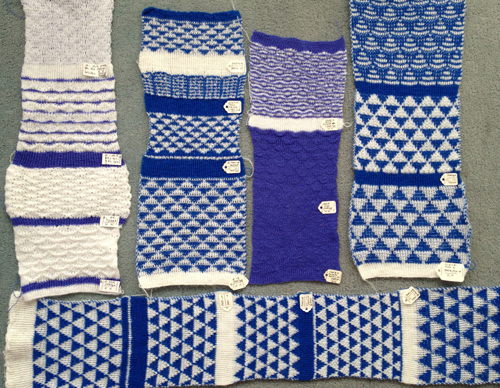 In knitting the selection row is made toward the color changer. 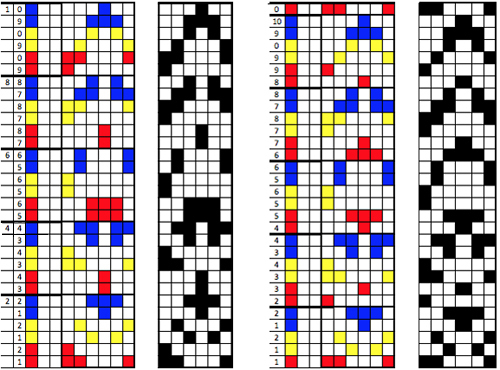 In rows where color 3 is not represented, only the first and last needles are selected, and manually pushed back to B position. Eliminating end needle selection can cause problems at outer edge of other colors, eliminating blank rows from graph and knitting would require much more attention to where in repeat one is actually working, and lead to possible frequent mistakes in color sequence. 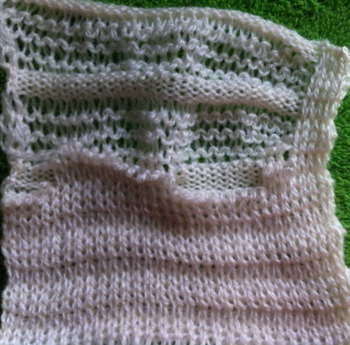 after pressing: flat, edge stitches too short attached to back bed before knitting pattern (purl side) knit side how to get top and bottom joining to match? 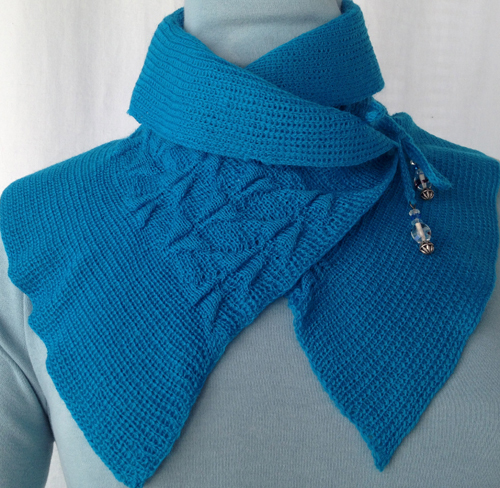 surprise: this baby knits up/steams fairly flat! 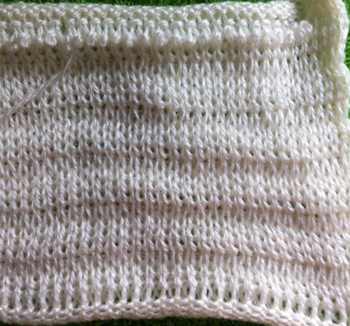 I now get why some people call drop stitch with this technique mock garter stitch, but that is so not what I was going for, so back to the drawing board for me! I have an idea…. 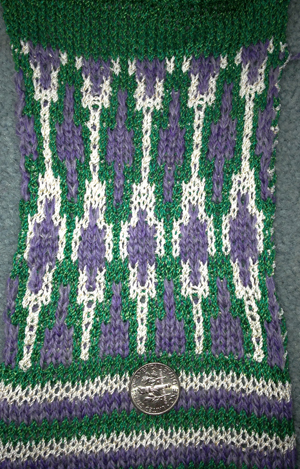 if the repeat is twice as long, and 2 of the 4 rows are knit without yarn, then loops created on the first 2 rows should in theory be dropped. 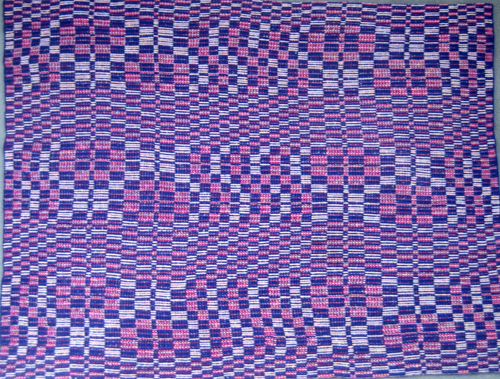 Tech 130 in essence doubles repeat length. 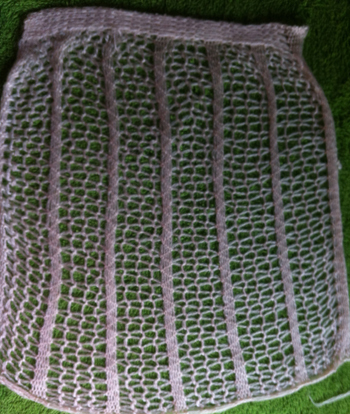 Using it and the same back bed pusher arrangement and settings as tech 256 the fabric is much more like the original, but tension now needs to be adjusted, denser knit stitches are now too loose… time for a very long break! 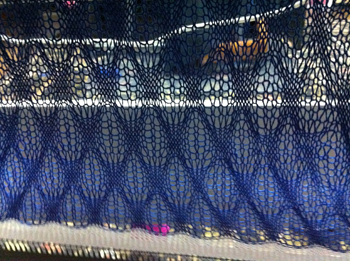 had the interesting experience while knitting the one above of both locks jamming in the color changer. So many ways to have fun! and … I still want some bubbles! 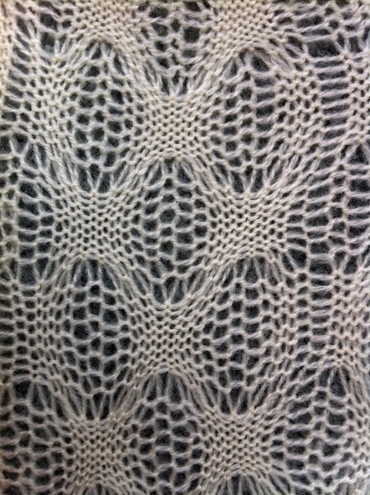 I had already been considering laces other than transfer for yarns that have been too crotchety to knit in that particular technique, and my Passap has been knitting idol for far too long. 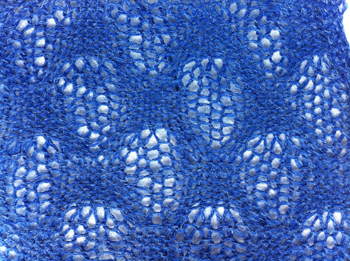 The fabric above seems to alter between purl and knit sequences that would would require transferring all stitches to opposite bed for every other pattern sequence: out of my range of patience and time. 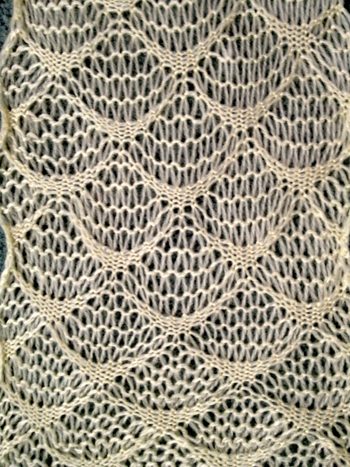 The number of fabrics involving “lace” produced using the ribber involves a series of names with sometimes variations simply being specific to the technique performed on a particular brand, though possible on all.On the list: drive lace, pick rib, summer fair isle, drop stitch lace, etc. 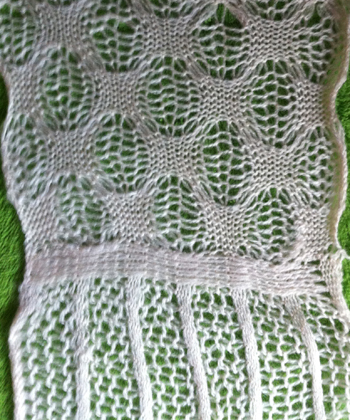 The above commercially produced knits seemed to be good candidates for drop stitch lace. 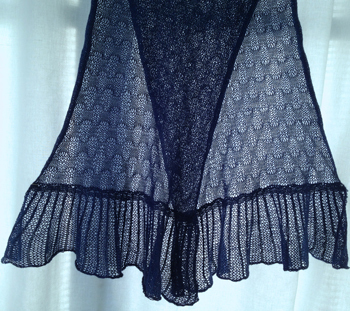 In this instance the fabric is produced as a hand technique, requiring racking and row counting. 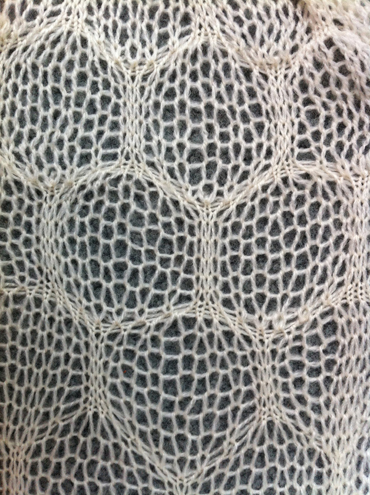 The process is easier if all stitches are transferred to ribber in Japanese KMs or back bed on Passap, and long stitches are then created by selected stitches knitting on the opposing bed, and in turn being dropped. 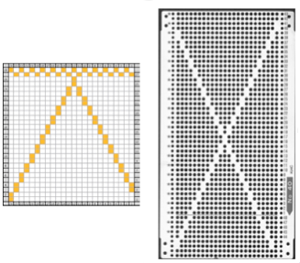 Punching a card, drawing on a mylar, or downloading to machines makes it possible to do so in pattern much more easily. 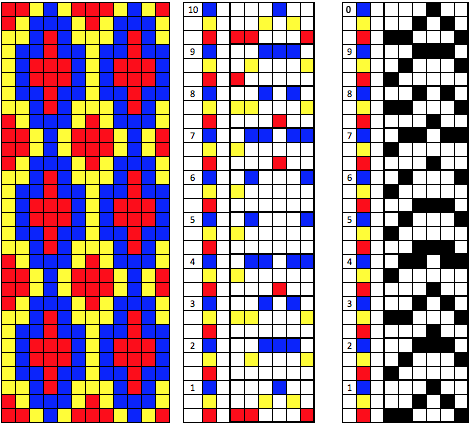 Punchcard books have several useable examples for such patterns. 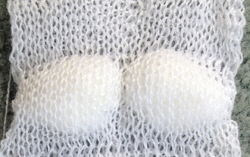 Two methods of release are used. 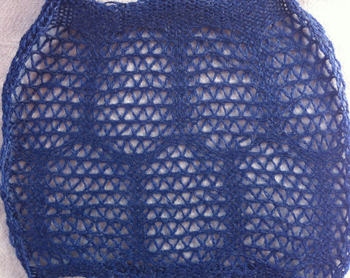 One is end release, where the pattern is knit until the piece is completed, and stitches are dropped then. 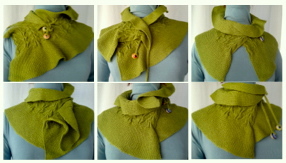 This works in friendly yarns and continuous repeats uninterrupted by rows of stocking stitch. 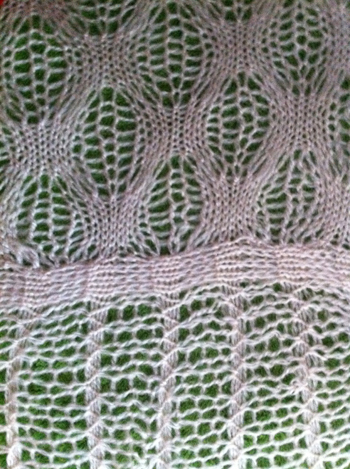 If the design is interrupted, then regular dropping of stitches whether at the end of the repeat or intermittently throughout is either required or preferable, depending on the design. 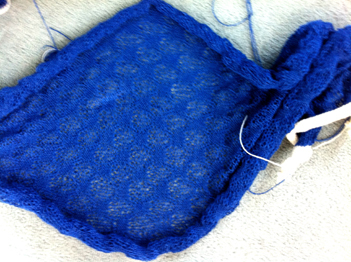 As for dropping those loops that will form the long stitches, one can do so “manually” with improvised tools. 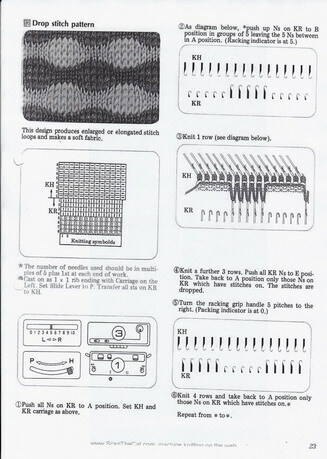 For more “automatic” dropping of stitches using knit carriage in Brother patterning, one may punch a card or draw a mylar with a method akin to color separation that will allow for a pass of the KH carriage across the knit with no yarn in feeder, “color 2” is actually “no yarn/empty”, while establishing the proper needle selection on its return. 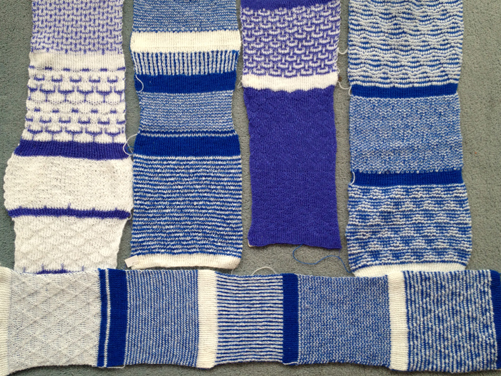 Studio selects and knits in same row, so needle selection disruption is not an issue, and in Passap techniques are built into the console that allow for “free/no yarn” passes. 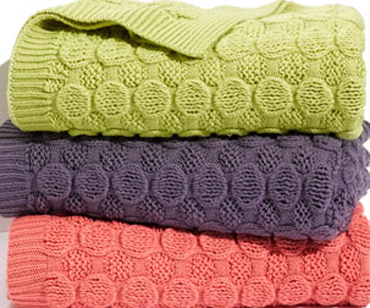 Both instances involve extra “knit” rows per item. 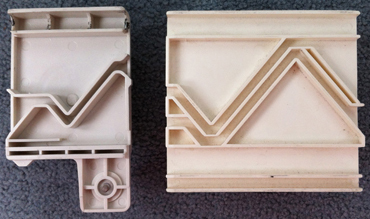 As another alternative tools may be used that help the stitch ditching process. Studio had their P carriage, and Brother their own “D slider” for the bulky KM. The Studio P carriage pulls needles on the main bed from B tp C position going from right to left, then returning them back to B position going from left to right. 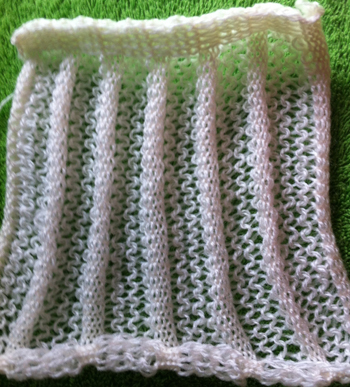 On the ribber it may be used to bring the needles up to C position for “safe knitting. (Studio needle positions are A, B, C, D, while Brother skipped the letter C, continuing with D and E). 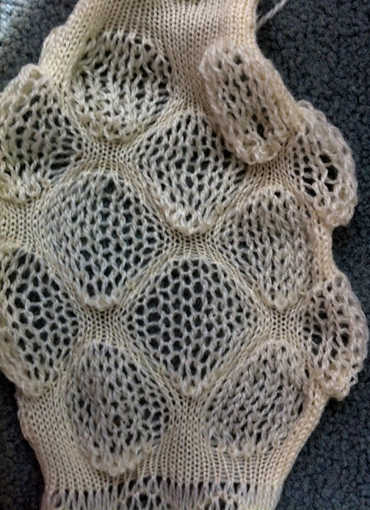 A video from Susan Guagliumi shows a later model than the one pictured below, used as well to bring needles out after hand techniques as opposed to pulling them out by hand after hand techniques, or to insure thicker yarn knitting. The Brother Bulky KR 260 D slider only moves in one direction, from left to right, completing the in and out needle position operation in one pass. 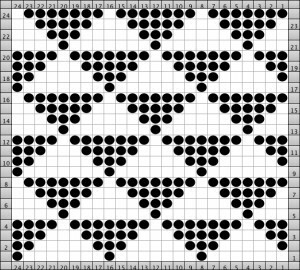 End needle selection needs to be cancelled. 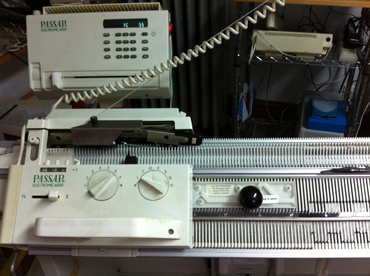 It is not used on ribber because of its double action. After operating it from left to right, it is simply lifted off. Knit carriage position may vary depending on personal preference and whether the yarn changer is in use or not. 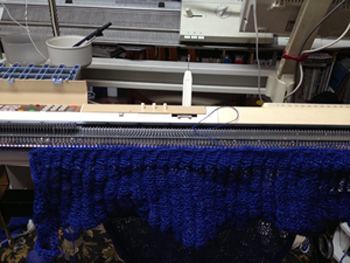 If patterning for long stitches occurs on the front bed, the Passap tool sits on rail where you see it in photo, it will release all stitches from needles in its path. 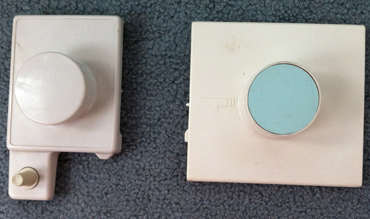 Often directions for using it recommend its use for 2 passes with locks on right. Passap preselects pushers for the next row of knitting as Brother preselects needles, pushers are below the rail, so in theory they should be unaffected by passes of its travels. Once things are up, going, and “working” I have found it possible to align the tool as seen in photo ahead of the next lock pass, so on right of lock from left to right, to its left from right to left, a bit of pressure will keep it in its place, and stitches are released each pass of the lock. This may result in having to operate the lock with one hand. 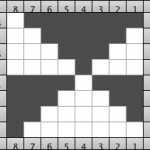 There is also an optimum speed: if movement is not smooth and regular and needles are jostled, pusher selection may be altered in response, thus resulting in a patterning “mistake” on the next row. 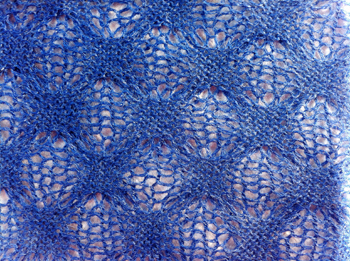 Challenging yarns may make this method impossible. 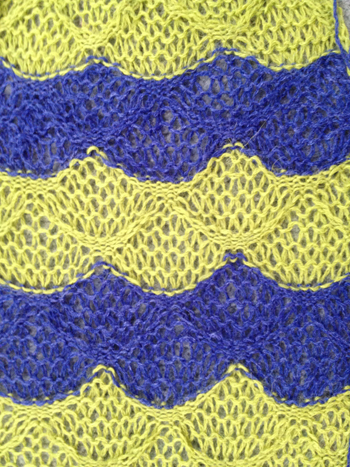 I am using Stitch Painter to plot out my repeats, exporting files as .cut files, using win crea to import cuts and download to console with a cable purchased from England. I replaced an ill tower dell with a 64 bit dell laptop half its age, and am now running windows XP instead of 98! My leaps into the present technologies/software are made using apple products. Technique 129 will work, color may need to be reversed using the alter loop, or within wincrea depending on how the pattern is drawn in the original graph, but that is a topic for another day (see april 2011 post: a bit on Passap for some information on Tech129). 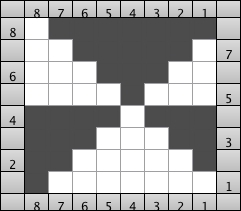 Back lock on N throughout, front lock on LX (slip/part on main bed for Japanese KMs). 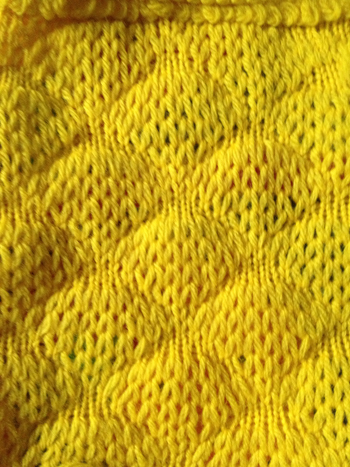 Single bed slip and tuck stitches may also produce “bubbles” of a different quality. 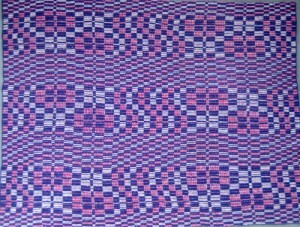 This baby blanket was a double bed knit on a Passap machine, inspired by the woven patterns found is early American coverlets. 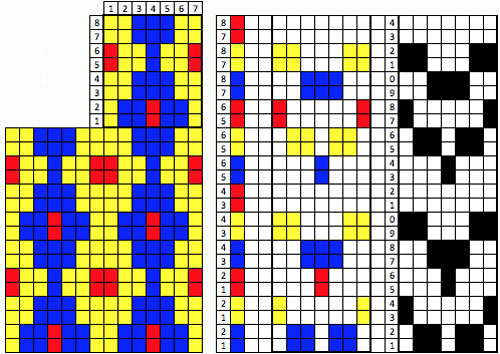 Blue, red and white are in use. 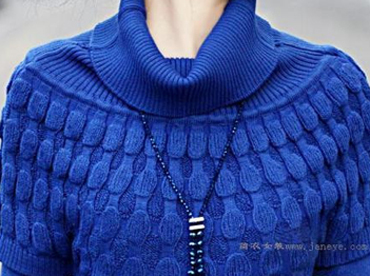 Because of the knitting technique as colors knit one at a time the alternate colors “bleed through”, giving the illusion of more or even different colors.